There is no denying that a healthy diet is integral to overall wellness and staying hydrated is absolutely vital. Every organ, every cell in your body contains water. In fact, when you don’t drink enough water and keep your body properly hydrated, it does not function as it should. The health of your spine and back depends heavily on whether you are properly hydrated. In fact, if you don’t drink enough water – plain, pure water – it could affect your back, causing pain and limiting mobility. To understand water’s role in spinal health, you first need to understand how the spine is constructed. The row of bones that make up the spine are called vertebrae. Between each vertebrae is a disc. This disc works like a shock absorber so as you bend, flex, and move about the disc provides a buffer so the bones do not rub together. Each disc is comprised of two parts. The center of the disc is the nucleus pulposis. It is made up mostly of water. The nucleus pulposis is surrounded by a tough, flexible ring that contains a gelatinous substance. It protects the inner area which is the cushion for the vertebrae. Two factors that further complicate the rehydration of the discs are aging and sedentary lifestyles. As you go about your daily activities, each time you move, the spine compresses the disc, squeezing out the water within. Even walking or sitting upright can cause this as gravity causes the spine to compress. When the disc does not have adequate water, the result is pain and lack of mobility as well as increased risk of spinal injury. When you are not properly hydrated your body cannot replenish the water in the discs, causing them to remain compressed. Beverages like soda are not adequate for effective hydration. You need to make sure that you drink enough water every day. 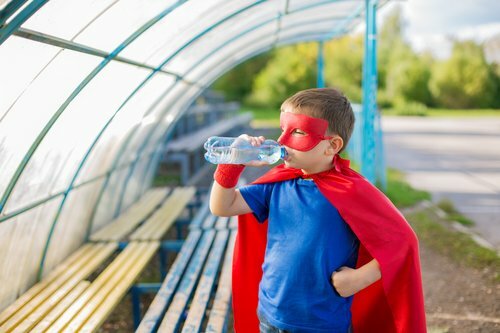 For years we were told that 8 eight ounce glasses of water a day was the rule for proper hydration, and that works for many people. However, an article in the Harvard Health Letter suggests that the body can be properly hydrated with 30 to 50 ounces of water a day. The article goes on to suggest that water can also be found in foods like spinach, watermelon, soups, and lettuce are also good sources for hydration. When the body is dehydrated the discs remain compressed instead of refilling. When that happens the overall function of the spine is compromised. Your constant back pain may actually be caused by dehydration. When the discs cannot refill they can’t do their job. This leads to immobility and a compromised range of motion. Hydration also plays an important role in how the cerebrospinal fluid moves and works. While it does require more than water to function properly, water does play an important role. When the body is dehydrated this fluid cannot move as it should which can even affect brain function. On a larger scale, when the body is dehydrated it begins to retrieve water from other parts of the body so it can reroute it to the vital organs and sustain life. The extremities are the first places it pulls water from and the spine is another. When it deprives the spine of water in order to supply the organs then you remain in a constant deficit which can cause pain and mobility problems. As the body rehydrates itself, it does not assign the spine as a priority. The vital organs take precedence so the spine basically gets what is left over. If there is already a deficiency present, then there is nothing left over to rehydrate the spine. When there is adequate water in the body, normal activity and movement aids in the rehydration of the discs. The most significant rehydration occurs while you sleep though. When you lie down and rest your body is best able to initiate the process of rehydrating your spinal discs via osmosis. Chiropractic care is another way to adjust the spine and encourage the refilling of the discs. That depends, of course, on proper water intake. Be good to your spine; it’s the only one you have.